This entry was posted in photo, street photo. Bookmark the permalink. I’m glad she did, too, Helen. I love the intensity on her face. And touching the statues–yes, that is what I would have done! Thank you, lovely girl. Thanks, Lois. I thought we were not supposed to touch the statues… 😉 I have to say… that girl was the highlight of my visit! Great thing and a great result.. Thanks, Raj. I like that title! Most of the times these small cameras or the smartphones create better picture because you are shooting them candid. Moment you hold up your big guns the people generally become alert and their expressions change. Who knows this girl would have given you the totally different reaction. With dslrs whenever I do these kind of candid shots I always do a zoomed shots. You captured her expression, lovely and delightful! Great photos!! Thank you, Amy. I felt lucky. She was the highlight of my visit. Well done, these are images with layers of meaning. Thank you, Sally. Layers of meaning — that’s how I feel about a lot of things. Wonderful photo, Helen. It looks like a lovely statue, too; she’s grabbing a muskrat, no doubt for food. I can imagine this is an interesting memorial. Thank you, Jet. 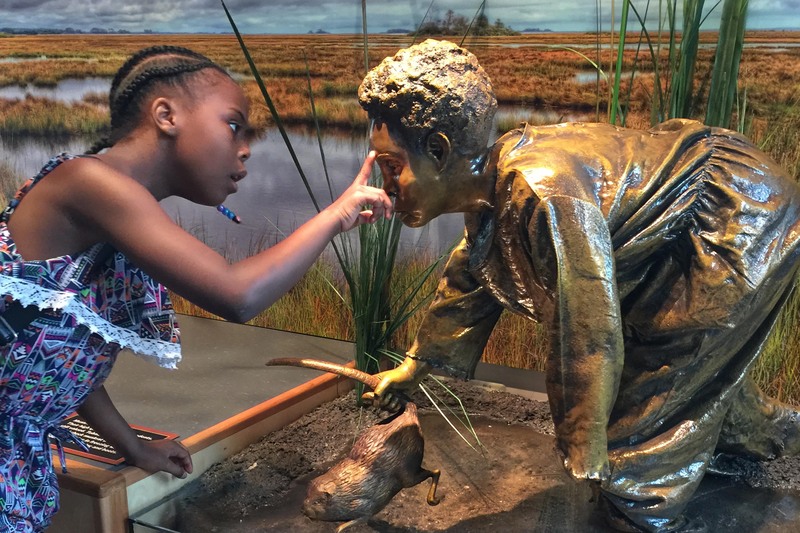 When Harriet slacked off at her weaving job, she would be assigned to check muskrat traps — she started at age 6! 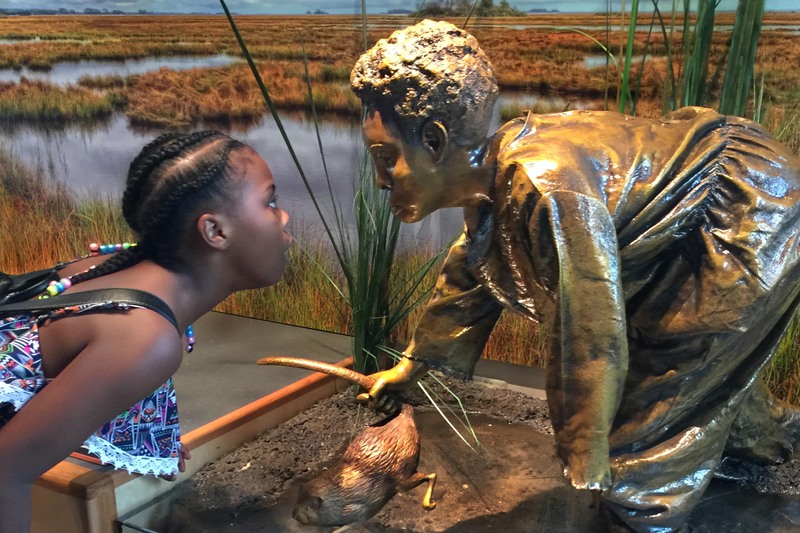 My daughter and I visited the National African American museum a couple of weeks before I went to this center. I think we spent 4 hours there and didn’t even had time to go upstairs, and less than an hour at this center. Lots to see. I know. I really wanted to give her a copy of her photos. Thank you, Edward. Have a wonderful day. Thanks Helen. you too, have a wonderful day. I love these, especially the first one n which the girl mirrors the statue. Her interest and curiosity are almost palpable. And maybe astonishment and delight at seeing a statue of someone who looked like her. Much better than statues of confederate generals…. Sometimes the best shots are those spontaneous ones like these two. Brilliant, Helen! Thanks, Hien. You are so right. She definitely brightened my day. Ha.